Sven Schienhammer emits some more incredibly deep dub techno transmissions from his base on a cloud somewhere above Berlin. 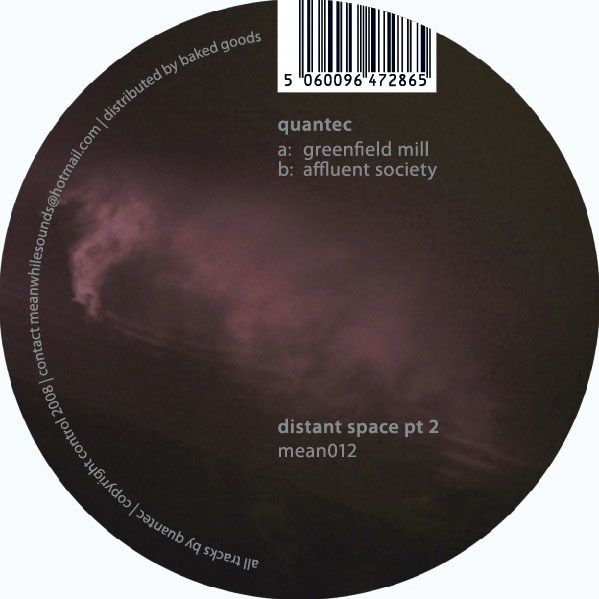 Following on from his massively acclaimed first installment for Meanwhile earlier this year, 'distant space pt.2' contains two of the deadliest dub tech tracks you're likely to hear in 2008, with 'Greenfield Mill' carving out a comfortable slot next to the M-Series with a massively sub driven slab of skank house cushioned by those unbelievably deep atmospherics, while 'Affluent Society' toughens up the patterns for a deeply affected 4/4 roller, heaving under the pressure of dense kick/sub/bass pressure and licked by some luscious dub chord stabs that just leave us in a dribbling mess. It can sometimes be hard to separate the wheat from the chaff with the glut of dub techno in recent times, but we can definitely assure you this comes with the Ian Botham seal of approval. Good for your heart.